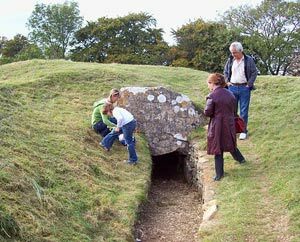 If you’ve ever visited the Nympsfield Long Barrow at Coaley Peak, you probably thought there wasn’t a lot to see. A mound with a dent in the ground, some large stones and an information board giving a few details. 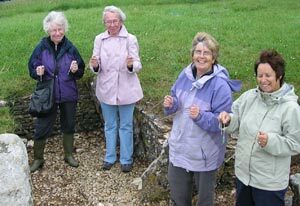 Yet when our dowsing group visited on Thursday 10th June, our rods indicated a great deal more, which was quite exciting. Our leader told us not to read the board before we began as that was cheating and might skew our results. We began by asking when the Long Barrow was built and all rods indicated 3200 BC, or 5,000 years old, which the information board confirms. Significantly it lies East West, facing the rising the sun. Our rods indicated there were men, women and children buried there, but our numbers ranged from 12 to 17. The information board says 17. Soon a couple of our members who are experts in this field began exploring the site and made some remarkable discoveries. Sacred places were usually built on rising ground and our rods indicated an avenue approaching the main entrance with five steps leading up to it. Not far away we dowsed and found a round house (built 2300 BC) with a healing pit within it, where you could stand if you were sick or in pain, and your bad energy would go down into the earth. There was also a mortuary building and several ancient graves nearby so maybe this form of healing did not always work! Having dowsed what had once been the physical, we moved on to earth energies, mainly spirals which usually appear in pairs and can be either beneficial or detrimental. The pair travels upwards, over and downwards and then back under to form a toroid or a bagel on it's side in a continuous movement, being energy. If you visit and start to feel nauseated, you are probably standing in a downward spiral. Move just a few feet away and you will immediately feel better. Even the wild flowers in the meadow respond to spiral energy. Where we detected an upward spiral, the oxeye daisies were significantly larger, healthier and more prolific. Nature does know best. The BBC Gloucestershire website has a fabulous 360 degree panoramic video of Nympsfield Long Barrow that's well worth a visit. 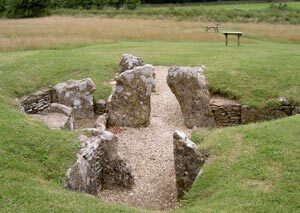 Nympsfield Long Barrow is on Frocester Hill, adjacent to the Coaley Peak Picnic Site, once covered by a mound 27m long by 18m wide and with a horned forecourt.